See image below depicting Buschke-Ollendorff syndrome. 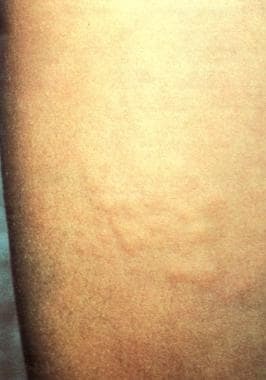 Plaque of grouped papular eruptions on the thigh. When visceral or metabolic changes (diabetes) are present, the prognosis can be serious. The cause of mortality may be malignant transformation of bone densities into osteosarcoma, chondrosarcoma, and giant cell tumor. The otosclerosis with hearing impairment, stenosis of the aortae, and diabetes found in this syndrome make the patient's condition serious. [4, 15, 16] However, in general, Buschke-Ollendorff syndrome follows a benign course. The associated lesions are generally asymptomatic, begin in childhood, and persist throughout life, often found as incidental findings  . The patient and/or the patient's family should be educated concerning potential complications. Benli IT, Akalin S, Boysan E, Mumcu EF, Kis M, Türkoglu D. Epidemiological, clinical and radiological aspects of osteopoikilosis. J Bone Joint Surg Br. 1992 Jul. 74(4):504-6. [Medline]. Crivellato E. Disseminated nevus anelasticus. Int J Dermatol. 1986 Apr. 25(3):171-3. [Medline]. Dahan S, Bonafe JL, Laroche M, et al. [Iconography of Buschke Ollendorff syndrome: x ray computed tomography and nuclear magnetic resonance of osteopoikilosis]. Ann Dermatol Venereol. 1989. 116(3):225-30. [Medline]. Lin F, Morrison JM, Wu W, Worman HJ. MAN1, an integral protein of the inner nuclear membrane, binds Smad2 and Smad3 and antagonizes transforming growth factor-beta signaling. Hum Mol Genet. 2005 Feb 1. 14(3):437-45. [Medline]. de la Salmonière P, Janier M, Chemlal K, Lazareth I, Carlotti A, Charasson I, et al. [Buschke-Ollendorff syndrome]. Ann Dermatol Venereol. 1994. 121(10):718-20. [Medline]. Umaretiya PJ, Miest RY, Tollefson MM. A 5-year-old with connective tissue nevi: Buschke-Ollendorff syndrome. J Pediatr. 2014 Jul. 165(1):206. [Medline]. Boyaci A, Boyaci N, Tutoglu A. Familial osteopoikilosis. J Back Musculoskelet Rehabil. 2013. 26(3):247-50. [Medline]. Ehrig T, Cockerell CJ. Buschke-Ollendorff syndrome: report of a case and interpretation of the clinical phenotype as a type 2 segmental manifestation of an autosomal dominant skin disease. J Am Acad Dermatol. 2003 Dec. 49(6):1163-6. [Medline]. Hellemans J, Preobrazhenska O, Willaert A, Debeer P, Verdonk PC, Costa T, et al. Loss-of-function mutations in LEMD3 result in osteopoikilosis, Buschke-Ollendorff syndrome and melorheostosis. Nat Genet. 2004 Nov. 36(11):1213-8. [Medline]. Trattner A, David M, Rothem A, Ben-David E, Sandbank M. Buschke-Ollendorff syndrome of the scalp: histologic and ultrastructural findings. J Am Acad Dermatol. 1991 May. 24(5 Pt 2):822-4. [Medline]. Ben-Asher E, Zelzer E, Lancet D. LEMD3: the gene responsible for bone density disorders (osteopoikilosis). Isr Med Assoc J. 2005 Apr. 7(4):273-4. [Medline]. Grimer RJ, Davies AM, Starkie CM, Sneath RS. [Chondrosarcoma in a patient with osteopoikilosis. Apropos of a case]. Rev Chir Orthop Reparatrice Appar Mot. 1989. 75(3):188-90. [Medline]. Lagier R, Mbakop A, Bigler A. Osteopoikilosis: a radiological and pathological study. Skeletal Radiol. 1984. 11(3):161-8. [Medline]. Saussine A, Marrou K, Delanoé P, et al. Connective tissue nevi: An entity revisited. J Am Acad Dermatol. 2011 Oct 18. [Medline]. Giro MG, Duvic M, Smith LT, Kennedy R, Rapini R, Arnett FC, et al. Buschke-Ollendorff syndrome associated with elevated elastin production by affected skin fibroblasts in culture. J Invest Dermatol. 1992 Aug. 99(2):129-37. [Medline]. Blum AE, Hatter A, Honda K, Lu K. An unusual presentation of Buschke-Ollendorff syndrome. J Am Acad Dermatol. 2011 Jul. 65(1):e25-6. [Medline]. Morrison JG, Jones EW, MacDonald DM. Juvenile elastoma and osteopoikilosis (the Buschke--Ollendorff syndrome). Br J Dermatol. 1977 Oct. 97(4):417-22. [Medline]. Schorr WF, Optiz JM, Reyes CN. The connective tissue nevus-osteopoikilosis syndrome. Arch Dermatol. 1972 Aug. 106(2):208-14. [Medline]. Al Attia HM, Sherif AM. Buschke-Ollendorff syndrome in a grande multipara: a case report and short review of the literature. Clin Rheumatol. 1998. 17(2):172-5. [Medline]. Atherton DJ, Wells RS. Juvenile elastoma and osteopoikilosis (the Buschke-Ollendorf syndrome). Clin Exp Dermatol. 1982 Jan. 7(1):109-13. [Medline]. Cantatore FP, Carrozzo M, Loperfido MC. Mixed sclerosing bone dystrophy with features resembling osteopoikilosis and osteopathia striata. Clin Rheumatol. 1991 Jun. 10(2):191-5. [Medline]. Miklaszewska M, Szybejko-Machaj G, Szepietowski J. [Buschke-Ollendorf syndrome - case report with a literature review.]. Dermatol Klin Zabieg. 1999. 2:85-9. Schnur RE, Grace K, Herzberg A. Buschke-Ollendorff syndrome, otosclerosis, and congenital spinal stenosis. Pediatr Dermatol. 1994 Mar. 11(1):31-4. [Medline]. Woodrow SL, Pope FM, Handfield-Jones SE. The Buschke-Ollendorff syndrome presenting as familial elastic tissue naevi. Br J Dermatol. 2001 Apr. 144(4):890-3. [Medline]. Surrenti T, Callea F, De Horatio LT, Diociaiuti A, El Hachem M. Buschke-Ollendorff syndrome: sparing unnecessary investigations. Cutis. 2014 Aug. 94(2):97-100. [Medline]. Kennedy JG, Donahue JR, Aydin H, Hoang BH, Huvos A, Morris C. Metastatic breast carcinoma to bone disguised by osteopoikilosis. Skeletal Radiol. 2003 Apr. 32(4):240-3. [Medline]. Smith AD, Waisman M. Connective tissue nevi; familial occurrence and association with osteopoikilosis. Arch Dermatol. 1960 Feb. 81:249-52. [Medline]. Holbrook KA, Byers PH. Structural abnormalities in the dermal collagen and elastic matrix from the skin of patients with inherited connective tissue disorders. J Invest Dermatol. 1982 Jul. 79 Suppl 1:7s-16s. [Medline]. Hematoxylin and eosin stain shows the histopathologic features of the skin lesions. Small longitudinal lesions of increased bone density in the proximal epiphysis of the left tibial bone and in the distal epiphysis of the right tibial bone. Orcein stain of elastic fibers shows the histopathologic features of the skin lesions. Weigert stain of the elastic fibers shows the histopathologic features of the skin lesions. Plaque of grouped papules on the abdominal coat.